ED Jallah delivers presentation in Kakata, Margibi County as the participants listen attentively. 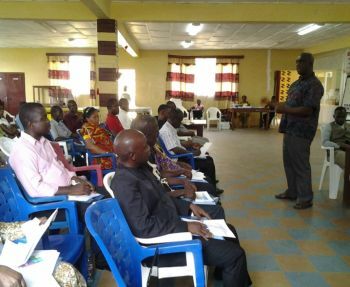 As part of efforts to strengthen the procurement capacity of staff involved with theimplementation of public procurement, the Public Procurement and Concessions Commission (PPCC) with support of USAID-GEMS conducted procurement workshops for local authorities in three regions across Liberia so as to facilitate the rollout process of the Framework Agreement Concept. This concept is a strategic component of proper budget use and effective expenditure management. It enhances efficiency and ensures value for money in public procurement. The rollout process of Framework Agreement commenced in the 2015-2016 fiscal year, when the first workshop was held in the facility of the S.T. Nagba United Methodist Church in Sinkor. It was followed by two others held in Monrovia at different times and venues. All of these efforts have been directed towards augmenting the capacity of procurement staff across Government, with a view to increase their level of effectiveness and efficiency in discharging their respective procurement duties, which ultimately leads to the attainment of value for money in public procurement. Similar workshop was held in the Conference Hall of the National Elections Commission (NEC) prior to the conduct of the regional framework agreement workshops in Zwedru, Gbarnga, and Kakata, from May 2-6, 2016. Several procurement staff from the counties could not attend the workshop due to travel difficulties. It is in light of this that the Commission collaborated with USAID-GEMS to extend the rollout process to the counties for greater efficiency in the procurement process. Addressing local authorities on Monday, May 2, 2016 during the official start of the workshop in Gbarnga, Bong County, PPCC Chief Executive Officer James Dorbor Jallah, called for a coordinated approach to fight corruption. He asserted that procurement entities have the responsibility to fully adhere to the PPC Act irrespective of where they operate. Mr. Jallah explained that thetraining engagement with local authorities on framework agreement is intended to ensure the prudent use of public resources with the view of achieving economy, efficiency, transparency, accountability and value for money in public procurement. The workshop was facilitated by staff of the Commission. Over one hundred local officials from the fifteen political sub-divisions of Liberia including those from the health and education sectors, municipalities, and private or faith based institutions who receive subventions from the Government of Liberia participated. Topics delivered at the workshop include: The Vendors Register and Implementation of 25% SBA Procurement, Overview of Framework Agreement, Advance Procurement and Types of Framework Contracts, Conduct of Non-Consulting Services Procurement, and Sample Framework Agreements.